Gerri-Lynn Fives. Coronado is My Home. An Outstanding REALTOR® and Proud Resident of the Coronado Community. Did You Know? Gerri-Lynn Fives formerly served as a U.S. Naval Officer. Gerri-Lynn Fives, of Prudential California Realty’s Coronado office, was recently named REALTOR® of the Year for 2011 by the Coronado Real Estate Association (CREA). Fives received the prestigious award in recognition of her ethics, integrity, service to the community and the entire real estate industry. Fives has been honored with the San Diego Association of REALTORS® (SDAR) Leadership Award and voted best in overall client satisfaction by the readers of San Diego Magazine for two years running. She finished 2011 as the #1 ranked individual agent in Prudential’s Coronado offices for her sales performance. Gerri-Lynn’s track record consistently shows her clients working with her time after time and referring her to their friends and family. Gerri-Lynn is an outstanding communicator and she understands the importance of listening closely to her client’s needs. 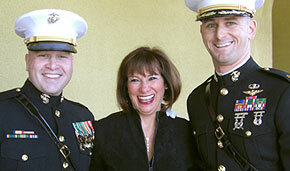 Strong ties to the military community for over 20 years. Department Head for the Health Promotion and Wellness Program at the U.S. Naval Hospital in Okinawa received the Civilian of the Quarter in 1997, Civilian of the Year in 1997, and the Bronze Award for third best ‘Health Promotion and Wellness Program’ Navy Wide. Completed the Army Dietetic Internship in 1981 and was a Registered Dietitian for 20 plus years. Commissioned officer in the U.S. Army in 1981 and served for 5 years. Graduated College of Saint Elizabeth, Convent Station, NJ with BS in Foods & Nutrition, Minor in Business Admin (1978).